Which is the valid CREATE TABLE statement? Every database object has a name. In a SQL statement, you represent the name of an object with a quoted identifier or a nonquoted identifier. A quoted identifier begins and ends with double quotation marks ("). If you name a schema object using a quoted identifier, then you must use the double quotation marks whenever you refer to that object. A nonquoted identifier is not surrounded by any punctuation. Names of databases are limited to 8 bytes. Names of database links can be as long as 128 bytes. If an identifier includes multiple parts separated by periods, then each attribute can be up to 30 bytes long. Nonquoted identifiers cannot be Oracle Database reserved words (ANSWER D). Quoted identifiers can be reserved words, although this is not recommended. Depending on the Oracle product you plan to use to access a database object, names might be further restricted by other product-specific reserved words. The Oracle SQL language contains other words that have special meanings. These words include datatypes, schema names, function names, the dummy system table DUAL, and keywords (the uppercase words in SQL statements, such as DIMENSION, SEGMENT, ALLOCATE, DISABLE, and so forth). These words are not reserved. However, Oracle uses them internally in specific ways. Therefore, if you use these words as names for objects and object parts, then your SQL statements may be more difficult to read and may lead to unpredictable results. In particular, do not use words beginning with SYS_ as schema object names, and do not use the names of SQL built-in functions for the names of schema objects or user-defined functions. You should use ASCII characters in database names, global database names, and database link names, because ASCII characters provide optimal compatibility across different platforms and operating systems. Nonquoted identifiers must begin with an alphabetic character (ANSWER B-begins with 9) from your database character set. Quoted identifiers can begin with any character. Nonquoted identifiers can contain only alphanumeric characters from your database character set and the underscore (_), dollar sign ($), and pound sign (#). Database links can also contain periods (.) and "at" signs (@). Oracle strongly discourages you from using $ and # in nonquoted identifiers. Quoted identifiers can contain any characters and punctuations marks as well as spaces. However, neither quoted nor nonquoted identifiers can contain double quotation marks or the null character ( ). Within a namespace, no two objects can have the same name. Columns in the same table or view cannot have the same name. 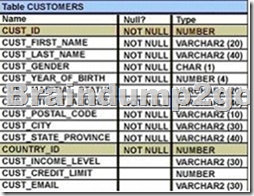 However, columns in different tables or views can have the same name. Procedures or functions contained in the same package can have the same name, if their arguments are not of the same number and datatypes. Creating multiple procedures or functions with the same name in the same package with different arguments is called overloading the procedure or function. A. A table name can be of any length. B. A table can have any number of columns. C. A column that has a DEFAULT value cannot store null values. D. A table and a view can have the same name in the same schema. E. A table and a synonym can have the same name in the same schema. F. The same table name can be used in different schemas in the same database. Synonyms are database objects that enable you to call a table by another name. You can create synonyms to give an alternative name to a table. A. A foreign key cannot contain NULL values. B. A column with the UNIQUE constraint can contain NULL values. C. A constraint is enforced only for the INSERT operation on a table. D. A constraint can be disabled even if the constraint column contains data. E. All constraints can be defined at the column level as well as the table level. - Constraints enforce rules at the table level. - Constraints prevent the deletion of a table if there are dependencies. B. The column with a UNIQUE constraint can store NULLS . C. A constraint is enforced only for an INSERT operation on a table. D. You can have more than one column in a table as part of a primary key. The above command fails when executed. A. SYSDATE cannot be used with the CHECK constraint. B. The BETWEEN clause cannot be used for the CHECK constraint. 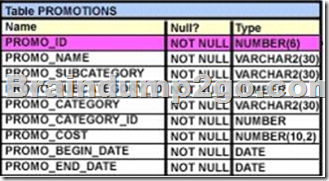 C. The CHECK constraint cannot be placed on columns having the DATE data type. A single column can have multiple CHECK constraints that refer to the column in its definition. There is no limit to the number of CHECK constraints that you can define on a column. CHECK constraints can be defined at the column level or table level. The command to create a table fails. A. You cannot use SYSDATE in the condition of a CHECK constraint. B. You cannot use the BETWEEN clause in the condition of a CHECK constraint. C. You cannot use the NEXTVAL sequence value as a DEFAULT value for a column. A single column can have multiple CHECK constraints that refer to the column in its definition. There is no limit to the number of CHECK constraints that you can define on a column. CHECK constraints can be defined at the column level or table level. You plan to give a discount of 25% on the product price and need to display the discount amount in the same format as the PROD_PRICE. Which SQL statement would give the required result? Use TO_NUMBER on the prod_price column to convert from char to number to be able to multiply it with 0.25. Then use the TO_CHAR function (with formatting'$99,999.00') to convert the number back to char. Not C: Use the formatting'$99,999.00' with the TO_CHAR function, not with the TO_NUMBER function. 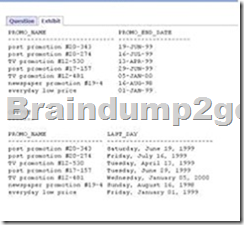 View the Exhibit and examine the data in the PROMO_NAME and PROMO_END_DATE columns of the PROMOTIONS table, and the required output format. Using the CUSTOMERS table, y ou need to generate a report that shows an increase in the credit limit by 15% for all customers. Customers whose credit limit has not been entered should have the message " Not Available" displayed.